Do you have a digital camera? Do you have a Flickr account? Do you have messy kitchen drawers? 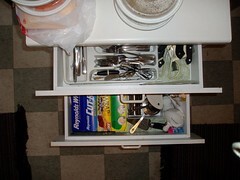 I created a Flickr Group called Kitchen Drawer where we can all showcase our amazingly organized (or dis-organized) kitchen drawers. If you'd like to join the group, you can do that on the Flickr page, if you don't want to join perhaps you could just post on your own blog and share a link back here? We've all got our dirty little secrets, just like those "Desperate Housewives" show us your messy drawers, come on, I dare you! on a side note, i think blogger has the spam under control now. i don't use word ver and i haven't had spam in about 3 weeks. Are we allowed to tidy the drawers before taking photos?? Thankfully you aren't asking for pictures of the inside of our closets!! No Karen, you aren't allowed to tidy them up first, that's the whole premise...the one of Surprise! I am OCD. My drawers are labelled. Seperated by colors and sizes. I am gonna be the laughing stock of the internet. Days like this I wish I had Digital Camera! !